Everyone knows I have a deep love for all things sweet… doughnuts, biscuits, cookies, cakes and tray bakes are the loves of my life (and Rob too obviously). 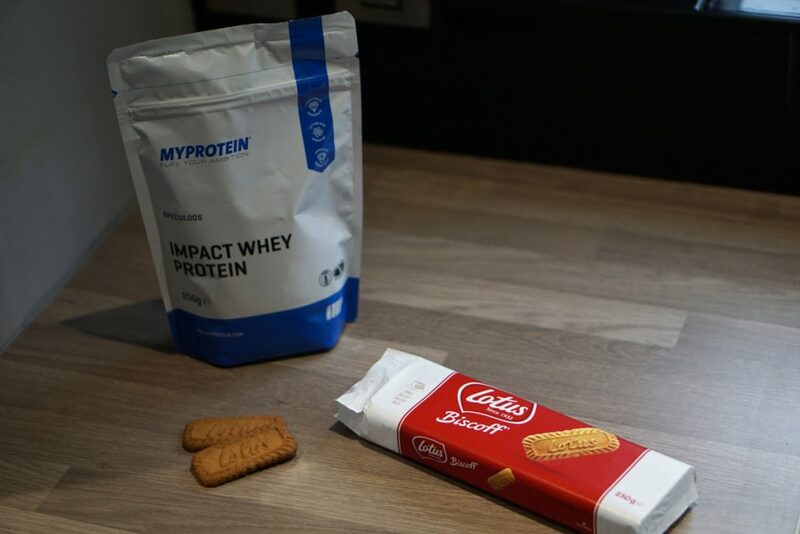 So imagine my glee and excitement when I learnt that MyProtein brought out a SPECULOOS flavoured whey protein. Ever had those ever so delicious spicy cinnamon-y caramel-y little bisucits served with a coffee? These are speculoos spice biscuits (or cookies) from Belgium. Lotus Biscoff are (in my humble opinion) the market leader in the UK for the glorious speculoos biscuits. So of course in order to make this an absolutely fair test, review and comparison I bought an entire packet, just to be sure. Impact Whey from MyProtein has a really good macro profile, low in carbs and high in protein, which is perfect for me and my goals right now! As I’ve said before, sometimes these special flavours can be a bit of a miss – peanut butter cookie you broke my heart – so I proceed with trepidation. I love me some proats, so obviously the first thing I did was try a scoop of the Speculoos in my morning oats. Oh and then have a bite of a Biscoff, cos you know, science. First thoughts and feelings are positive, this whey smells sort of spicy and cinnamon-y so that’s a good start. And then the first spoonful reveals that this is a taste sensation. It’s sweet and it’s got that underlying tang of spice – not too strong but complementary to the sweet taste. Does it taste like Biscoff? 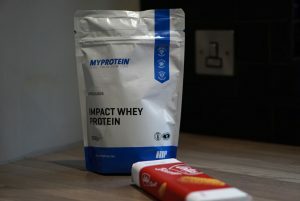 Not an exact match, but pretty close, and this whey definitely has a distinct speculoos flavour so it does as promised! I’ll definitely buy this one again. You can grab a bag of this limited edition flavour on MyProtein’s website. This post is not sponsored and reflects my own personal honest opinion however affiliate links are used to support the running costs of this blog where appropriate! I bought this too and yes, it does seem to taste like speculoous BUT THE caramel is not that present and also it does not dissolve very nice at least in my case.Luckily i don’t drink it but put it in my oats so that does not bother me that much.But even though i bought a 250g package i wish i would’ve bought a smaller one.Or a sample as i feel i Won’t buy it again.My opinion.I think I will use it in baking something . I can see what you’re saying about the caramel, that’s maybe the bit I couldn’t quite put my finger on! I have a bit of a weird way of mixing mine in so maybe that’s why we had different experiences with the mixing; I always pre-mix with a bit of water, wait for the oats to cool slightly then combine both together. Let me know if you do any baking, would love to try it in some recipes! 2019 Christmas present ideas for health, fitness and gym lovers! Hibernation mode strong – too cold for the gym!